We extend a welcome to anyone so interested – you don’t even have to be an active beekeeper. 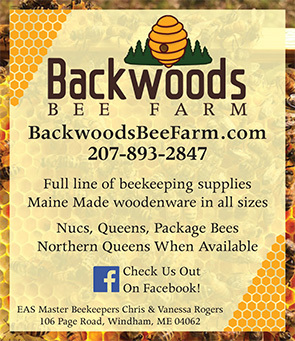 The organization publishes an informative newsletter, sets up exhibits, and participates at fairs and charitable activities, in order to accomplish our principal goals: to educate and inform Maine beekeepers on the theory and practice of sound beekeeping, to represent the interests of beekeepers before the state legislature and in the statewide agricultural community, and to provide information about bees and beekeeping to the public-at-large. Our membership represents every level of experience and expertise. Our newsletter, is published bi-monthly for the months of February, April, June, August, October, and December. The production schedule and the contents of the newsletter are timed to coincide with the “Beekeeper’s Calendar”. This is the yearly sequence of events observed in nature which impact hive activities and determine the responsibilities and actions of the beekeeper. This all-day gathering of beekeepers from all over the state features speakers of national reputation, a buffet luncheon, and a fund-raising raffle. There is a charge for admission above dues. Membership in the organization is required to attend. We are proud to be able to collectively support important scientific research. Currently $1 (7% of regular annual dues) is donated to the EAS Foundation for Honey Bee Research. A membership packet will be confirmation to new members that your contact information and dues have been received. The MSBA prohibits discrimination against current or prospective members on the basis of race, color, gender, religion, national origin, age, disability, sexual orientation, or any other legally protected characteristics.